An ongoing issue in human robot interaction (HRI) is how people and robots communicate with one another. While there is considerable work in real-time human-robot communication, fairly little has been done in asynchronous realm. Our approach, which we call situated messages, lets humans and robots asynchronously exchange information by placing physical tokens – each representing a simple message – in meaningful physical locations of their shared environment. 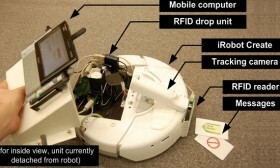 Using knowledge of the robot’s routines, a person can place a message token at a location, where the location is typically relevant to redirecting the robot’s behavior at that location. When the robot passes nearby that location, it detects the message and reacts accordingly. Similarly, robots can themselves place tokens at specific locations for people to read. Thus situated messages leverages embodied interaction, where token placement exploits the everyday practices and routines of both people and robots. We describe our working prototype, introduce application scenarios, explore message categories and usage patterns, and suggest future directions.